For years now, I've been keeping mental notes about depictions, rhetoric, and general trends of the cult-like popular television shows. For example, within reality shows, there's a strong notion about "voting " and "immunity." Obviously, these two ideas can be seen to easily mirror some of the largest cultural issues of Americans in this last decade. The 2000 and 2004 elections , with their dubious dynamics and results no doubt made a gigantic impression in the collective unconscious—for everyone on either side of the issues. The saying, "You have immunity "is the Holy Grail for reality show contestants. It means they have survived and get to partake of yet another round of challenges in their little-Hero's Journey. This idea of "immunity" seems loaded when we think of this past decade's now-iconic images of massive crowds in city streets sporting surgical masks, the constant coverage about foot-and-mouth disease, Avian flu, SARS, and H1N1. The hysteria is likely a response to the literal and symbolic notion of our global and developing single-world community. Another big dynamic within popular television is forensics. There are numerous real stories on cable channels, with shows like Cold Case Files, Forensic Files, Crime 360, The New Detectives, and several others. Even non-crime shows capitalize on forensic analysis: PBS's excellent series History Detectives, as well as paranormal oriented ones like Monsterquest, UFO Hunters, and more. But because of their creative freedom, perhaps the most intriguing information can be gleaned from the fictional forensic dramas, especially the CSI franchise shows. There are events within the episodes that are very set apart in tone from the detective work—the meticulous collection of evidence at the crime scene, the postmortem exam, and most notably, the laboratory sequences. 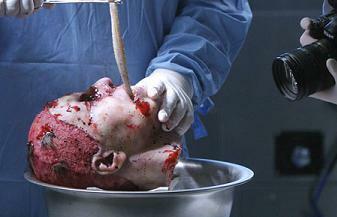 The postmortem exam is usually filled with dialogue and commentary, with little reverence. In fact, it is obvious much effort is taken to punctuate the morbidity and grotesque. Altogether, these sequences usually have a high clinical and mundane, grounded feel. Usually, the room is brightly lit, no music is present, more than one person is present and conversations are filled with ironic, personal or even off-topic chatter. This is the raw deal of physical death--there's nothing sacred here. This is contrasted with the collection of evidence, and especially the lab analysis scenes. In both, there are dimly and dramatically lit rooms, technotrance-postrock music playing, and no dialogue. Altogether, it creates an otherworldy sense of reverie; it is meditative, sacred even. The technician or CSI is usually working alone, and shown only in silhouette, in unusual and close-up camera angles, or fragmented somehow—it's a solitary, focused, but yet unfinished, un-whole venture. Toward the end of the sequence, there's usually the first shot of the technician depicted in a medium shot, with brighter lighting, with a knowing smile—a look of accomplishment. Through her meticulous processing and lab work, she has found the key to the mystery. This can easily be seen as a postmodern alchemical experience. Could this notion have to do with the popularity of forensics in popular culture? 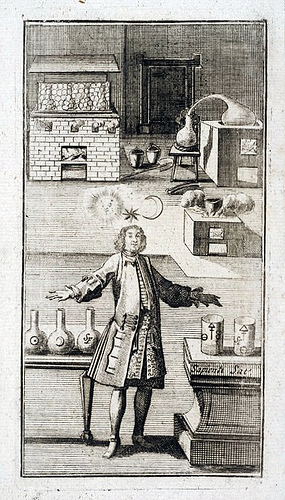 Although alchemy is not at the forefront of the current mass obsession with the paranormal and occult (like ghost hunting, freemasonry, 2012 hype, etc.) it's a powerful archetypal notion and absolutely aligned with our growing fin de siècle hysteria—which arguably officially began with the Y2K anxiety. CSI premiered in 2000; with its alchemical notions may be seen as a processing of the first outright concerns of the impending "cultural shift" that is now being funneled into the 2012 postulations. Positive, spiritual and physical personal transformation and union is at the heart of the alchemical quest—the end result being immortality, perhaps the ultimate human desire and goal, whether seen through a physical life-extension or religious/spiritual model. As 2012 approaches, mortality/immortality is at the heart of some of the biggest issues we face—even the life of our planet itself seems to hang in the balance, the go-green movement has taken on a do-or-die element. So, it's not surprising to find that one of our little windows into the collective unconscious—television—we find the alchemical laboratory, albeit disguised in high tech coolness, finding ultimate keys to mysteries, oftentimes through findings of DNA, a symbolical reduction of human our personal identity.